What lurks behind the curtains at New Zealand’s largest, and most iconic theatre? Find out as the team gets special back-stage access to this landmark of Auckland’s cultural history. The Auckland Civic Theatre is in the heart of Auckland City. It’s imposing Rococo facade looms over a busy and well-patronised intersection of bars, restaurants and retail outlets. The Foyer is decorated in the style of an Indian temple whilst the main theatre section employs an impressive and atmospheric “Arabian Nights” theme complete with a starlit domed sky, turrets, minarets and two large golden Abyssinian Panthers reclining on either side of the stage. The Civic’s interior houses six floors of dressing rooms, storage areas, function rooms, crew stations and operating apparatus consisting of complex pulley and cable machinery for screens and curtains. 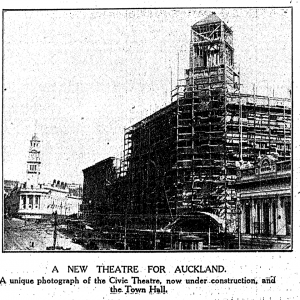 The 2,750-seat capacity Civic Theatre opened on 20 December 1929 on the site of the former Auckland City Market. The design of the complex boasted some innovative features such as a large room in the basement (Wintergarden) from which the main cinema screen above was viewable, the second largest Wurlitzer organ in the Southern Hemisphere and a large orchestra pit that could be elevated up onto the main stage. The Civic survived the great depression (despite the bankruptcy of its owner Thomas O’Brian) and it became a popular venue for American servicemen during the Second World War. The basement Wintergarden was transformed into a Cabaret and its resident scantily-clad adagio dance troupe kept the troops entertained with raucous and energetic performances. A particular member of the Wintergarden dance troupe, Miss Freda Stark was infamously daring and she had been known to perform on stage clad only in gold body paint or a g-string and feather headdress. Miss Stark’s ghost reputedly haunts the Civic despite the fact that she did not actually die in the theatre. 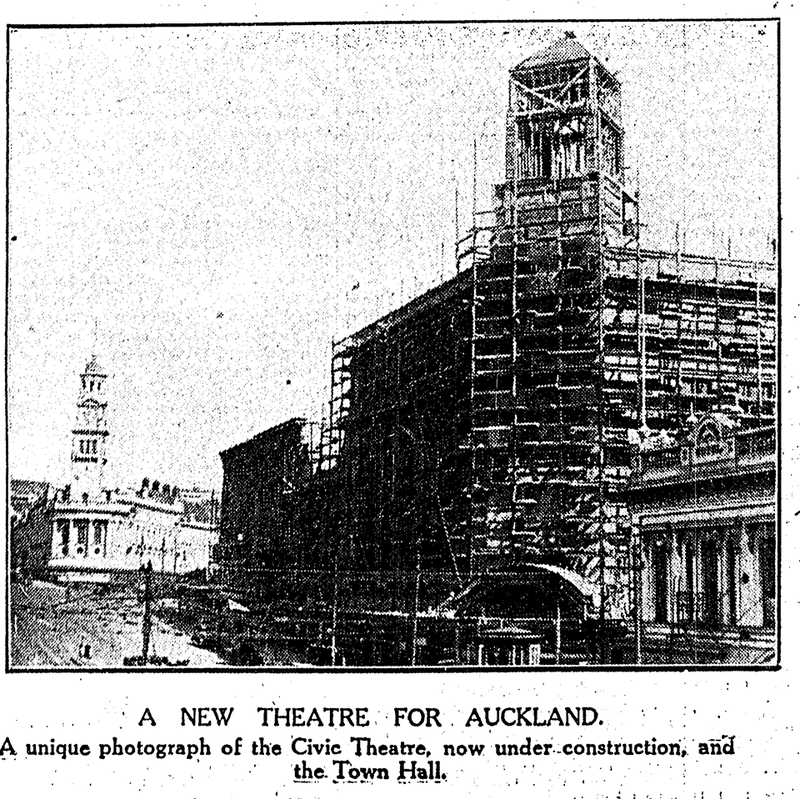 The Civic Theatre under construction. NZ Herald 11 September 1929. In the late 1990’s, the Civic was subject to an extensive renovation. It reopened on 20 December 1999, precisely 70 years after its first cinema screening. In addition to screening film festivals (with a revised seating capacity of 2,378), The Civic now hosts international stage musicals, concerts, conferences, functions and theatre productions. Haunted Auckland conducted an investigation in hot and very humid conditions, between the hours of 8pm and 12pm. Access to all areas was kindly granted to us by the Civic management and a Civic staff member accompanied the team during the investigation. A private function was in progress upon our arrival and as such, we were unable to operate within that particular room. (The alleged ghost of Freda Stark is reported to have been sighted in the vicinity of that particular area ). The building consisted of six floors including the Wintergarden basement area, dressing rooms, back stage areas, storage areas, crew rest areas, and function rooms. The top floors consisted mainly of gangways that ran along the circumference of the building giving crew access to the substantial and complex system of pulleys and metal cables that support the screens, curtains and other movable props of the main stage. The Haunted Auckland team members conducted their initial investigation in the large Wintergarden function room adjoining the auditorium before proceeding to the auditorium itself along with its large backstage area and several annexed dressing rooms. Later during the investigation, team members split into two groups of four and explored the lower floor (Wintergarden) and top floors on a rotating basis. This method was initiated due to the large size of building and it ensured that all areas were thoroughly explored by all team members. The investigation method consisted of photographic sweeps, ambient audio recordings and EMF monitoring. Static video camera monitoring was also established at various points. Various EVP sessions were also conducted by individual team members especially in the Auditorium and dressing rooms. Street noise from nearby bars and entertainment venues were of initial concern however, this noise was inaudible from inside the building. During the investigation the team obtained over 1000 photographs and several hours of audio and video. The following evidence has been reviewed by members of the Haunted Auckland team and been judged as possible evidence of paranormal activity at the Auckland Civic Theatre. The above audio was recorded in the backstage area of the main auditorium. The anomalous voice occurs at 16/17 seconds. Voice of team members can be heard directly after the anomalous voice, but they are more distant. The digital recorder which captured this audio was placed in such a position that the footsteps of anyone approaching it could be clearly heard on the audio, however no one was heard to approach or leave the recorder before or after this voice was captured. The first sample above has been trimmed from a longer piece of audio, but is otherwise unaltered. The second sample above is a copy of the first which has been amplified by 30dB to improve listenability. The above audio was also recorded in the backstage area of the main auditorium. The anomalous sound occurs at 10 seconds. The sound appears to be fairly close to the recorder when it was captured, however (as mentioned above) no one was able to approach the digital recorder without clearly being picked up on the audio, and no footsteps or movement were heard on the audio before or after this anomaly was captured. The Civic Theatre is certainly an atmospheric and impressive building. It conceals a vast infrastructure of passageways, gangways, rooms and doors. Haunted Auckland team members did not notice anything overtly unusual during the physical investigation. 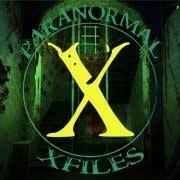 The accompanying Civic staff member who has worked at the venue as a senior stage technician for 5-6 years informed team members that neither he nor any of his colleagues have witnessed or heard anything that could be attributed to paranormal activity. Team members Barbara and Kel did report hearing voices in one of the dressing rooms but this was later discovered to be other members’ voices being transmitted from the stage to the dressing rooms via an intercom and through a speaker mounted on the ceiling. 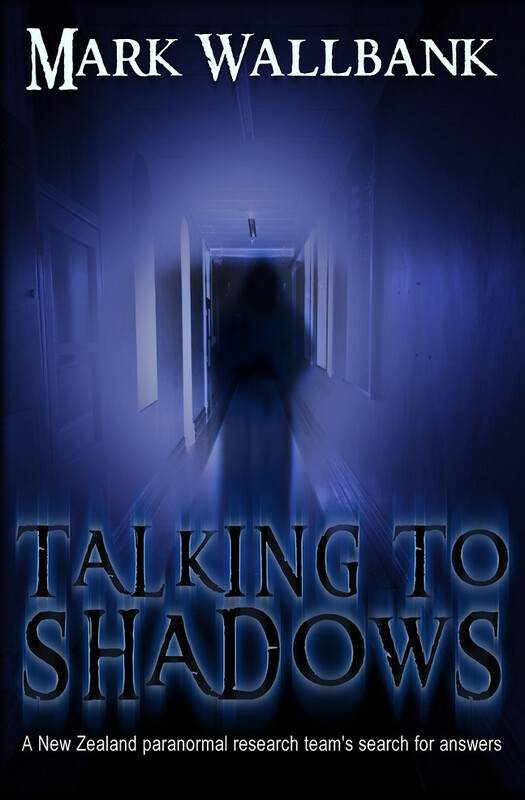 Team member Kris did experience some unexplained sensations of vibration when asking questions during an EVP session in the auditorium and a feeling of vague but benevolent presences however no other phenomena was reported. Chris (our guide for the evening) reported a cabinet back-stage that staff experienced unusual sensations when accessing it in the dark. Our team member Matthew scanned cabinet for EMF, and while there was a high magnetic field due to the presence of iron clamps and equipment for set-rigging, no unusual electric fields detected. However, to the right of the cabinet however on a wall pillar, a small mirror (about the size of a handheld signal mirror) was taped to the wall. The position in relation to the tool cabinet was such that the mirror was in peripheral vision. People’s peripheral vision can be easily tricked in the dark, and this mirror’s placement may cause unexpected visual depth changes or movement that can come from viewing a mirror in the dark. Our guide Chris commented that he had never noticed the mirror before, although it appears to have been there for some time. A couple of metres to the right of the tool cabinet was the main power junction for the theatre. Chris advised that the cabinet (which was on wheels) was occasionally placed closer to these junction boxes. These junctions gave off an extremely strong electrical field, well off the scale of the EMF Meter, radiating out 1-2 metres from the junction. Standing closer than 2 metres from these junction boxes gave our investigator Matthew (who is generally not prone to EMF sensitivity) a pressure headache which lingered for around 30 minutes. 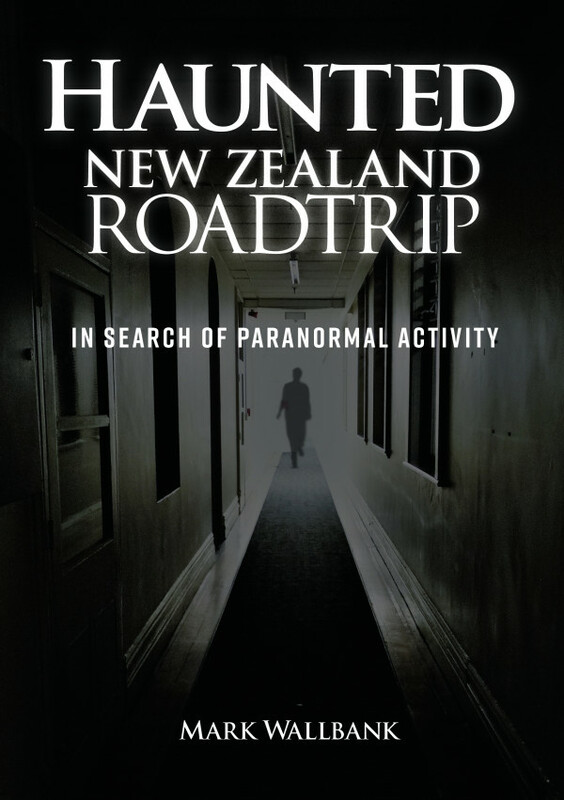 Haunted Auckland sensitives’ Kel and Barbara did provide some additional information that is worthy of inclusion in this report. Please note that the following information is team member Kel’s’ personal psychic experiences and does not constitute evidence of paranormal activity. The inclusion of psychic data is controversial however, Haunted Auckland continues to evaluate and include such data with an open mind. Wintergarden – Presence felt, no name given when asked. Back Stage – Presence felt, noise heard from locked dressing room door. Dressing Rooms (Stage Level) – Presence of male felt, name of “Fred Astaire” given when asked (Kel feels this was a mischievous answer given by the presence). Taken in context it is interesting considering the dance/cabaret history of the building. Main Stage (1) – Presence felt, part name of “Fran” given when asked. Positive answer given by presence when asked if a photograph could be taken by Barbara. Barbara reported complete camera malfunction when attempting to take the photograph. Main Stage (2) – Another presence felt in seating area – presence directed Kel to seat 36. Strong presence felt in next seat on left. Experienced dizziness and word “suicide” sensed. Fellow team member arrived and presence moved to seat behind. Basement – Presence felt, presence asked to move items such as coat hanger. No movement detected. Upper Level Gangways – Presence felt by Kel and Barbara. Barbara greets presence – presence responded to Kel “You silly woman, it’s too hot”. (This is interesting considering the oppressive heat and humidity that was indeed present throughout the building). Presence felt on very top floor, no name given when asked. Numerous presences felt when looking down onto stage area from gangways. Trials of the Ghosthunter M2 iPhone/iPod were continued at the Civic investigation. Two team members tested the applications’ consistency and it was found that information provided from individual units did not correspond with each other whilst in EVP mode. It can be assumed from a technical point of view that the EVP mode of the Ghosthunter M2 application is a random word generator. Previous results would suggest further trials are to be continued although the possibility of coincidental word relevance in relation to environment remains high.Team member Kris continues to trial the ‘Wordbox’ smartphone application. He received several words in each location, of which the more interesting (but tenuous) are transcribed below. Haunted Auckland stresses that the following transcript does not provide evidence of paranormal activity. Row – The auditorium contains 2,378 seats in a curved row configuration. Political – Possible relevance due to the nature of the building. Apart – Kris was sitting in a separate wheelchair area at the time. Mr – In response to question posed by Kris asking if anyone present knew who was ‘sitting in the box’. Sat – Possible relevance due to prevalence of seating. Hearing – Possible relevance due to nature of building (as in hearing music or theatre). Box – Possible relevance to VIP boxes in the auditorium. 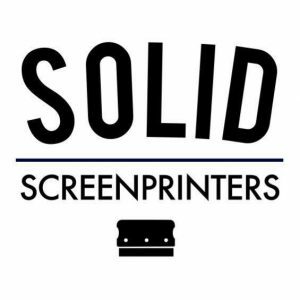 Frame – Possible relevance to mobile wooden frames containing scenery and/or backdrops used for productions. Light – Possible relevance to the lighting rigs which are on the upper floors. Cloth – Possible relevance to the curtains and cloth backdrops that are suspended from the upper floors. Mice – It is conceivable that mice could inhabit the gangways of the upper levels. Kris suggested that people in the auditorium appear as small as mice from the upper levels. Social – Possible relevance due to nature the nature of the building. People – Obviously, people do frequent the theatre. Haunted Auckland group sensitives did experience some interesting interactions with possible entities however as this is not verifiable by either visual or audio evidence, Haunted Auckland is not able to present their testimony as conclusive proof of paranormal activity within the Civic Theatre. The Civic staff member Chris who accompanied us during the investigation, has not witnessed anything out of the ordinary during his several years of service as a senior stage technician. He also stated that none of his colleagues have reported any unusual activity that could be associated with paranormal events. The audio evidence in particular submitted with this report does contain some interesting material that cannot be readily explained. It is likely at the very least, that the Civic does contain some residual phenomena considering the wide range of artistic activity that has taken place within its walls over the past 83 years. It is thought in paranormal research circles that intense human emotion (in this case initiated by musical and/or theatrical performances) may be naturally absorbed by certain building materials such as stone, brick and concrete that contains quartz and silica etc. Events and sounds are then played back like a ‘psychic video’ due to unknown trigger mechanisms or they may be accessed by persons sensitive to such absorbed energies. There are also significant electrical fields throughout the building, particularly in the auditorium and Wintergarden function room. Strong electrical fields can undoubtedly cause unusual sensations in humans such as the ones described in the EMF Anomalies section in this report. The recent Haunted Auckland investigation at a private residence in Titirangi, Auckland is a good example of how exposure to strong electrical fields may interfere with normal brain activity and produce occurrences of a seemingly paranormal nature.